The previous article in this series discussed how having in-house CAD design engineers can streamline the process. Now that you have the design, it is time to get down to producing the first prototype. Finding a CNC shop with experience in prototypes to production manufacturing is imperative. This article will discuss streamlining the prototype of the concept. A CNC shop must have the proper CNC machining center capable of producing the product. Close tolerance machining and small part machining equipment in the same facility is paramount to streamlining the process. Production delays can result from having even one piece of produced off site. Coordination within a CNC shop with all the necessary equipment makes the process much easier and faster. A CNC machining center is only as good as the personnel who are operating the precision CNC machining equipment. Another key to streamlining the prototypes to production manufacturing process is finding a CNC shop that has experts in prototype production. Having CAD design and machining center specialists on site to work out the details, solve problems and keep the project moving forward is essential to streamlining the process. Getting the first prototype manufactured is the second step in the process of prototypes to production manufacturing. We have looked at the CAD design and the prototype production factors. A CNC shop that has both the in-house equipment and personnel can significantly streamline the process. 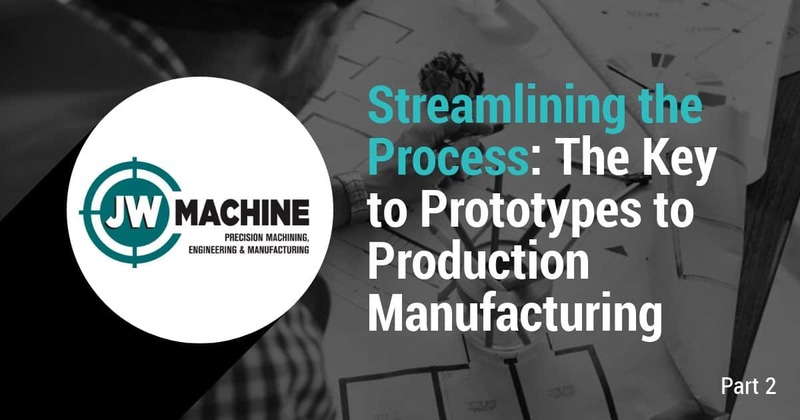 The next article in our series we will explore the manufacturing side of the prototypes to production manufacturing process.